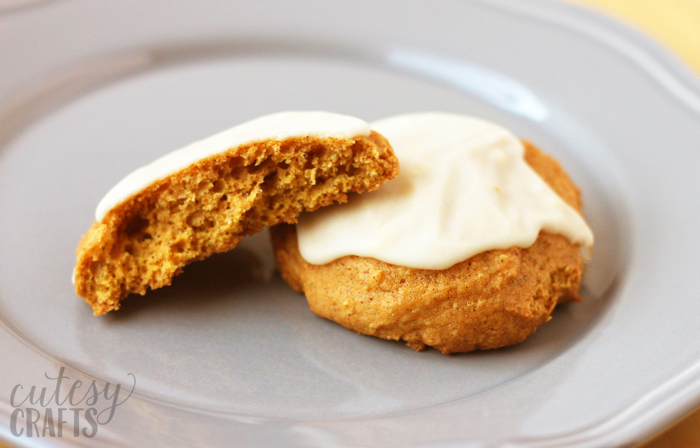 Every fall I try to make this iced pumpkin spice cookies recipe. 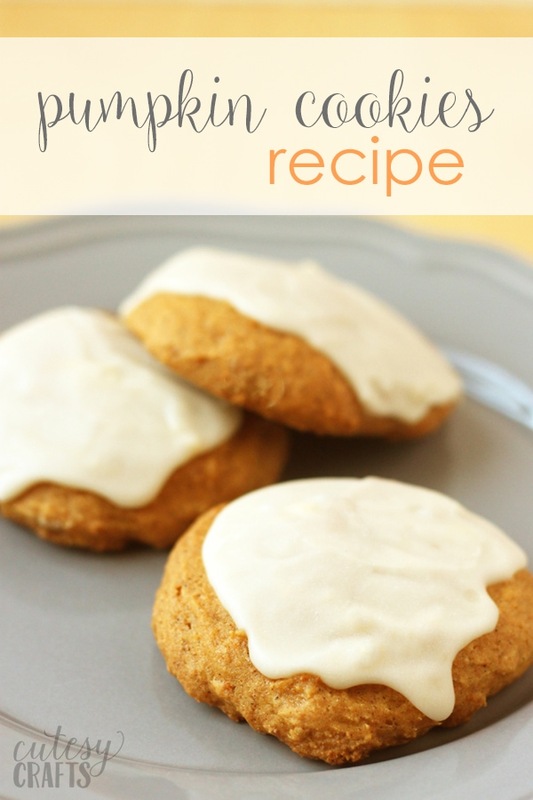 These pumpkin cookies are so delicious, and I love their texture! Any time I give them to people, they ask for the recipe, so I thought I would share it with all of you. Seriously, they are the best! This recipe is really easy. Just make sure you use pureed pumpkin and not pumpkin pie filling. Although I think I did that once, and just left out the spices. They didn’t turn out as good, but they still worked. I like my icing to be extra thick, but you can make it whatever consistency you want. Sometimes I even double the icing recipe if I want them to be extra sweet. My mouth is watering just looking at these. Diet starts tomorrow, right? 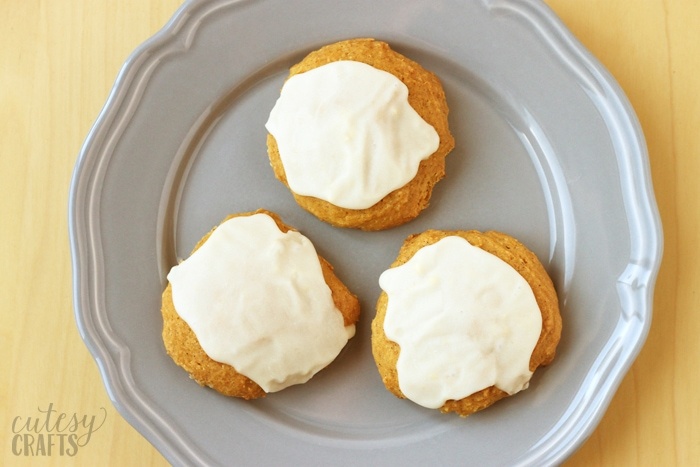 Hope you enjoy these iced pumpkin cookies as much as I do. Combine flour, baking powder, baking soda, cinnamon, nutmeg and salt. In a separate bowl, cream together butter and sugar. Add pumpkin, egg and vanilla. Beat until creamy. Drop on cookie sheet by tablespoonfuls and flatten slightly with the back of a spoon. Bake 350° for 15-20 minutes. Allow to cool completely and drizzle icing on top. Allow icing to cool and harden before storing. 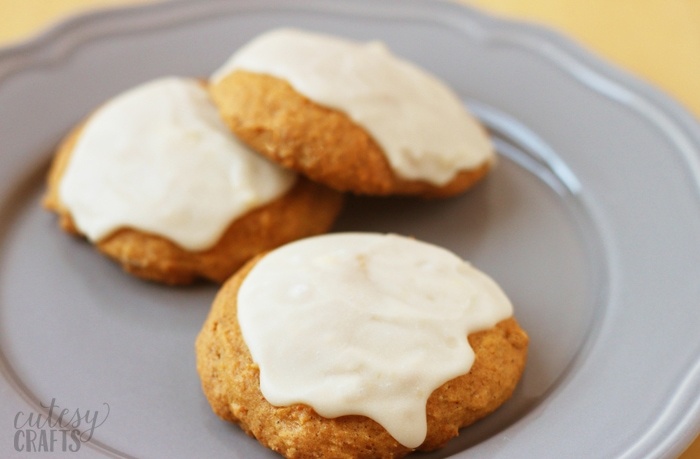 To make the icing: Combine sugar, milk, butter, and vanilla. Add milk as needed to achieve desired consistency. Many thanks for your lovely newsletter. You write the perfect blog, if I may say! You describe clearly and concisely, not too many photos (it drives me mad, looking for the text in among beautiful and artistic photos! ), and just a touch of the personal – Yes, we do want to know how you are and what you are thinking. I loved the video on embroidering lettering. Just long enough to clarify, Not long enough to become boring. Oh, thank you so much, Kate! That’s always my goal to provide enough information to finish the project without rambling on. Haha! It always makes my day to read comments like these. Thank you!